Our last post left us in M'hamid after our first night in the desert and camel ride. We headed out in our 4x4 to Erg Chicaga which has some of the largest sand dunes in Morocco and is fairly close to the border with Algeria. This took place on October 6th and 7th. Our first stop on the drive was a water source where we waited for another group to head into the desert. It was a neat little oasis area, with palm trees, camels, a friendly donkey, and frogs in the stream that seemed to appear from nowhere. Along the way we saw many signs of the rains from the night before in the form of interesting cracked patterns in the sand and very large puddles. With the other car joining us, we headed out into the sands. It was interesting as there were no signs or markings, and so the drivers must have known the routes from experience and memory. We had to take a few detours though due to large areas covered in water, and ended up getting lost. We stopped at a few nomad camps to ask for directions to our camp. We finally arrived only to find that the storm the night before had collapsed all the sleeping huts, and so we were directed to another camp further on. Our driver was getting fairly anxious at this point, as he didn't know the way to this new camp and the sun was setting. But we met up with the final car from our group who knew the way. We got there with no problems, except one of the trucks getting stuck in the mud and having to push it out. Not a common occurrence in the Sahara it seems! Upon arrival at the camp we took a quick hike up through the tall dunes to catch the last of the sunset, and then had an interesting time finding our way back in the dark. There was singing around a big oil lamp while we waited for dinner to be ready. Jerome and I went to a nearby dune and watched the most spectacular lightning storm I've ever seen in the distance in the pure dark of the desert. We watched the storm get closer, and dinner was served inside, just as the rain and wind hit the camp. It was a very impressive sight with the driving rain and wind being illuminated periodically by big flashes of lightning and rolling thunder. We were all quite happy to be huddled together in the concrete building. After dinner, the storm moved away, and the clouds cleared to reveal an impressive array of stars. With no lights in the vicinity you could see so many more stars than we're used to in the cities. We brought out some carpets and blankets and set up a little area along the side of the building and layed stargazing. We saw several shooting stars including one extreme one, that left a trail across the whole sky for several seconds. 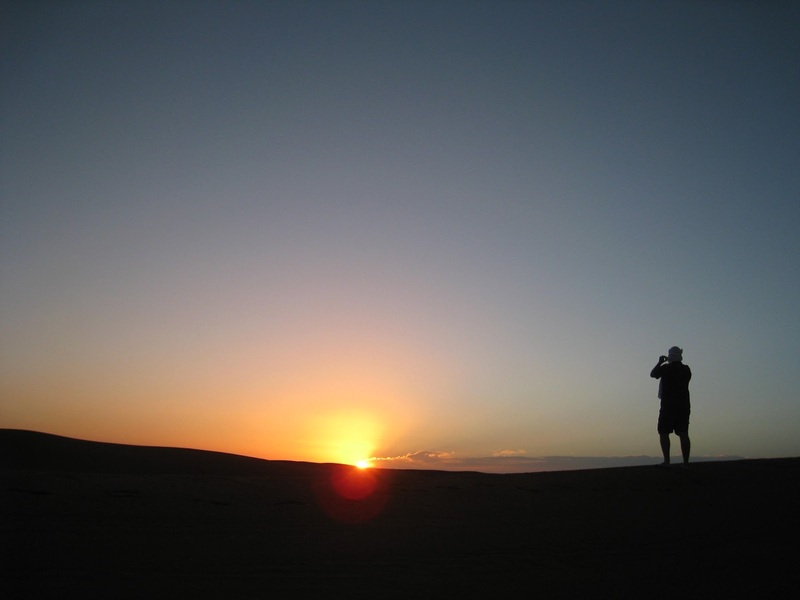 We eventually fell asleep out under the stars and had a lovely sleep until one of the guides came over to let us know that if we got up we could see the sunrise over the dunes. And so we did! 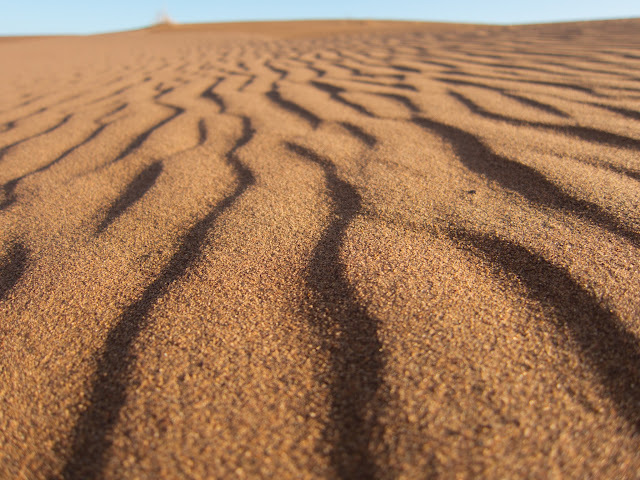 We walked along the dunes which were lit by the low red light, and took many pictures of the sun rising over the dunes, and the neat shadows they made. We hiked for at least an hour enjoying the peace and beauty. 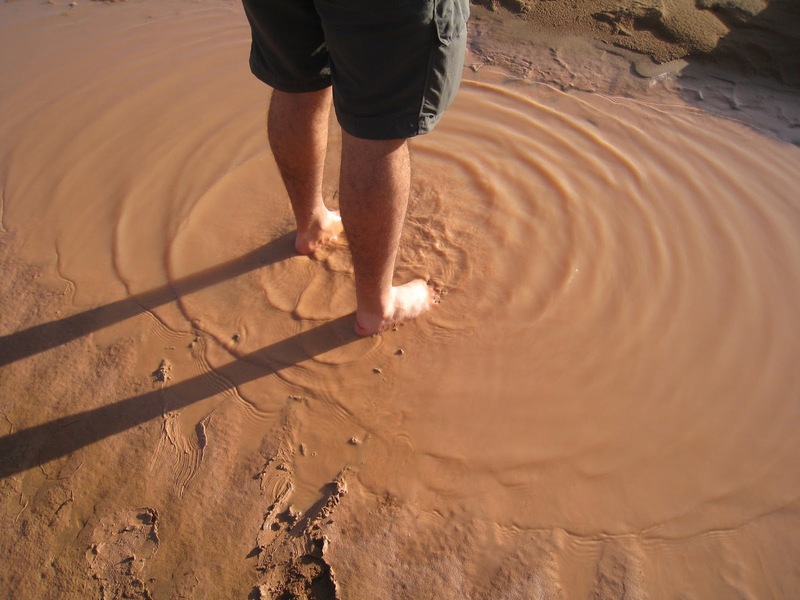 Along the way we came across some impressive mud puddles with super fine mud that was almost impossible to get off you. Jerome played in several of the puddles. We also found some neat silvery ants and some interesting plants and birds. When we got back to camp, we found that breakfast had been made and our share was left at the table sitting up on a dune. We ate up, and then had to pack up and head out. Some of the other guests were rather annoyed about the storms and that the trip wasn't quite the hot, sunny, dry experience they had envisioned. We on the other hand felt very lucky to have been there, as these were the first days of rain in the area in 6 years! Needless to say all the locals were very happy with the rain. 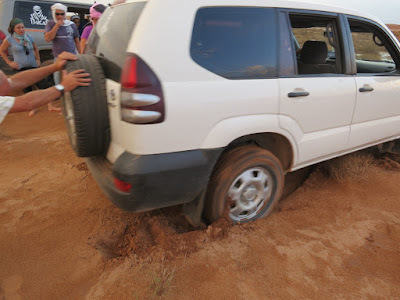 The drive back to M'Hamid was interesting as there were huge areas of sand which were now covered in water and so we had to navigate carefully to avoid getting stuck. There were even reports of a big bridge nearby being flooded out. We made our way back to the Hotel Riad Ouarzazate where we had stayed before leaving for the desert. One the way we stopped at a local pottery shop which had interesting wares, and then had lovely warm showers to try and get all the sand off of us, did some laundry, had a nice dinner, video chatted home and joined our parents' enjoying their thanksgiving dinner, and then made our plans for the next few days which I'll post about soon! I love the pics, they are gorgeous! Sleeping under the stars sounds amazing...did you guys get to eat any tagine-cooked things?